Dr. Annie Polland discusses the transition from Eastern European shtetls and cities to the crowded streets of the Lower East Side with a focus on Jewish immigrant women’s pivotal roles in both shaping their homes and New York’s growing economy. Annie Polland, the new Executive Director of the American Jewish Historical Society, will describe the holdings of the AJHS, including its HIAS records and how we can access these and other records. Dr. Annie Polland is the Executive Director of The American Jewish Historical Society (AJHS). Polland was formerly Executive Vice President for Programs & Interpretation at New York City’s Tenement Museum. 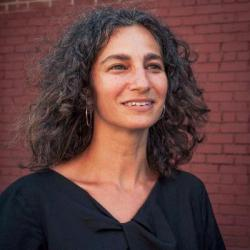 She co-authored the 2012 National Jewish Book Award winning Emerging Metropolis: New York Jews in the Age of Immigration. After the program, you’ll have an opportunity to find out about our Special Interest Groups (SIGs) by speaking with the leaders of the Belarus, Bessarabia, Poland, Ukraine, Litvak, and Sephardic SIGs.